RALEIGH, NC (May 26, 2015): New Life Camp of Raleigh is ready for summer, thanks to the volunteer efforts of David Weekley Homes team members. The group partnered with the Christian camp for a day of spring cleaning and beautification projects, and presented the organization with a $2,000 donation. The Weekley team spent the day at camp staining the archery and rifle range, shelters and shooting benches. The team also stained boat slips at the lake. 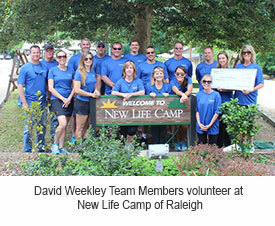 Established in 1950, New Life Camp of Raleigh offers recreational activities, retreats and summer camps for children. Activities like basketball, archery, crafts and swimming help campers enjoy the value of both teamwork and individual accomplishment. For more information about David Weekley homes in Raleigh, homebuyers may call 877-542-9240.